With its Art Deco design, Prince Resort II is a stand-out along the coast of North Myrtle Beach. Located in the Cherry Grove Section, this resort offers one, two and three bedroom condominiums and has tons of amenities including an oceanfront pool, lazy river and kiddie pool, complete with a waterfall! There is no need to miss your daily workout routine since Prince Resort has its own exercise facility and afterward, relax in the whirlpool on the oceanfront deck. Garage parking makes entering your condominium even more convenient. 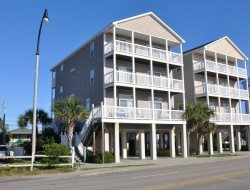 Prince Resort II is located directly across the street from the Cherry Grove Fishing Pier and miles of beautiful white sandy beach.